Standard - $19.99 Only 2 left! What sets the regular good guys from the super heroes? The super strength of course! And the chiseled good looks. Well, your kid already has those things. He can lift a car far above his head, and toss it clear across the room, a toy car that is. And he is the most handsome little man you have ever seen. But he is still missing something to make him feel like a REAL super hero. He is missing the costume, duh! 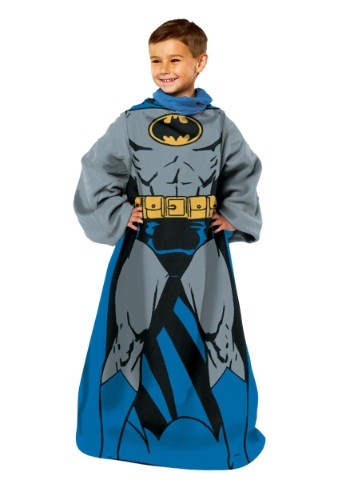 This Being Batman Child Comfy Throw to be specific. When he puts on this fleece Bat-suit he will be chasing down the bad guys, and fighting off anyone who is up to no good. He will use his mighty strength to his advantage, throwing the Joker right into jail. And when he is all tuckered out from his super hero adventures he will be tucked up tight in this comfy throw! I purchased this as a gift for my 6 year old nephew who loves Batman. He loves this comfy throw, as with the sleeves his hands are free to play video games or whatever else he may do! He was so excited and thought it was a very cool "blanket". Great price and fast shipping. I would highly recommend this product and this site!